R.I.P. 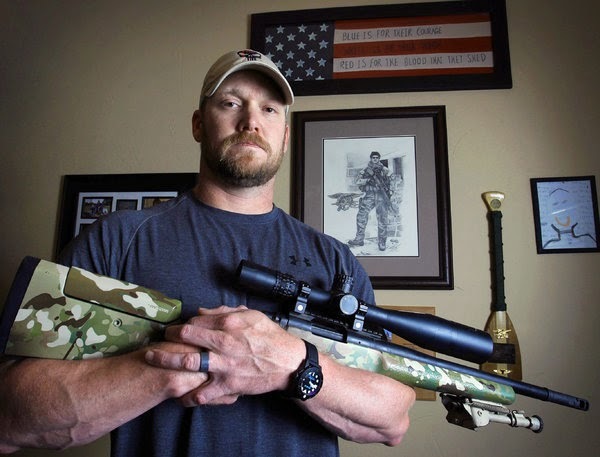 Chris Kyle, American hero & "Legend"
April 8, 1974 - February 2, 2013, Chris Kyle is the proclaimed most lethal sniper in United States military history, accumulating about 255 confirmed kills. American Sniper, released January 16, 2015, is based off of Chris Kyle's autobiography. Directed by Clint Eastwood, American Sniper broke many Box Office records and received 6 nominations, including Best Film and Best Actor. Texas Governor Greg Abbott announced that today, February 2nd, will be Chris Kyle Day in his memory. Many critics of the movie and of Chris Kyle, such as liberals Bill Maher and Michael Moore, show no respect for an American hero. They do not understand what it takes to go to war. There is a certain level of respect you give to veterans, especially a renowned hero like Chris Kyle. Americans all over the United States celebrated Chris Kyle Day today. Rest in peace to a true, American hero. R.I.P. to a real American hero! It was an amazing movie I recommend it!